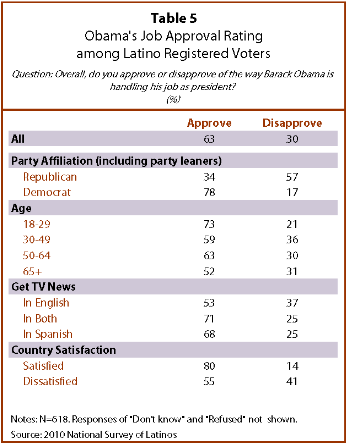 More than six-in-ten (63%) Latino registered voters approve of President Barack Obama’s job performance. This share is higher than Obama’s job approval rating among all registered voters—46%. (Pew Research Center for the People & the Press, 2010b). With the exception of Latino registered voters who identify with or lean toward the Republican Party, majorities of all groups of Latino registered voters say they approve of Obama’s job performance. Among Latino Republicans, fewer than four-in-ten (34%) say the same. Despite their strong support for the president, Latinos are divided about the impact of his administration’s policies on Latinos. More than half (51%) say the administration’s policies have had no effect on Latinos, while one-infour (26%) say they have been helpful to Latinos and 13% say they have been harmful. This is in contrast to the views Latinos expressed about the Bush administration in 2007. 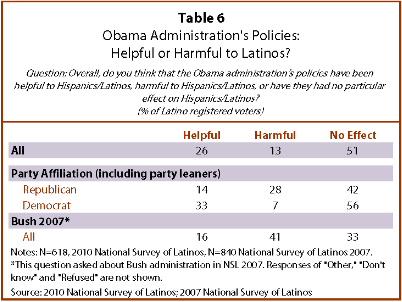 Then, more than four-in-ten (41%) Latinos said President George W. Bush’s policies were harmful to Hispanics, while just 16% said they were helpful to Latinos and 33% said they had no effect (Taylor and Fry, 2007).